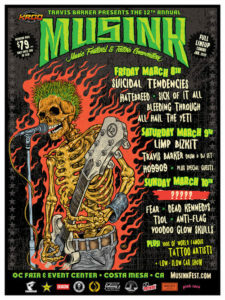 Travis Barker’s MUSINK, presented by KROQ, returns to the OC Fair & Event Center in Costa Mesa, CA Friday, March 8, Saturday March 9 and Sunday, March 10 for its 12th year as the premier festival bringing together the best of music, tattoos, and cars. MUSINK will feature hundreds of world-renowned tattoo artists, music performances from top rock and punk artists including Suicidal Tendencies, Limp Bizkit, Travis Barker (drum & DJ set), Fear, Hatebreed, Dead Kennedys, Sick Of It All, T.S.O.L. and more, as well as the Low ‘N’ Slow Car Showpresented by Famous Stars and Straps. Look for the full music lineup to be announced in early January. The initial list of participating tattoo artists includes: Jack Rudy, Freddy Negrete, Robert Atkinson, Juan Puente, Nikko Hurtado, Baba, Franco Vescovi, Travelin’ Mick, Norm, Big Sleeps, Grace Neutral, Emily Malice, and Britton McFetridge. The Low ‘N’ Slow Car Show presented by Famous Stars and Straps returns to MUSINK, and will feature the best selection of custom rides, American classics and lowriders in Southern California on display, all handpicked by Travis Barker. A limited number of special $79.00 Weekend General Admission Tickets are available for purchase until December 31 at 11:59 PM PT, while supplies last. These $79.00 (plus fees) tickets are priced even lower than last year’s tickets as a special thank you to all the diehard MUSINK fans that have been part of the festival for the past 11 years. 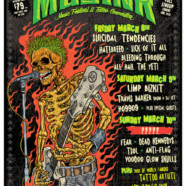 MUSINK hours are 3:00 PM – 10:00 PM on Friday, March 8 and 12:00 PM – 9:00 PM on Saturday, March 9, and Sunday, March 10. MUSINK 2019 is produced by Bill Hardie, Travis Barker, SGE, and Sean Akhavan. MUSINK partners include: Rockstar Energy Drink, Sullen, Famous Stars and Straps, Golden Crown Barber Shop, Dixxon Flannel Co., Johnny’s Saloon, Tecate, Angel City Brewing, Bulleit Frontier Whiskey, and Pink Taco. The OC Fair & Event Center is centrally located in Southern California, just off the 405 and 55 freeways at 88 Fair Drive in Costa Mesa. The venue is convenient to all in Orange County, as well as Los Angeles, San Diego, San Bernardino and Riverside Counties. John Wayne Airport in Irvine, CA is also easily accessible for those traveling from other parts of the U.S. and the world.